Pizza Soup – It’s for Dinner! This past Saturday night was a night out to celebrate with friends. When we have sitters come in and I know we will be out past dinner time we try have something simple on hand so that they and the kids can eat and we are assured it is something filling and hardy. I wasn’t about to let not being home throw me off my challenge of making new soups on a regular basis while the weather is cold. So I dug out my handy Hamilton Beach Slow Cooker and went to find something fun for the kids to try. Some time on Google later I decided to go with Pizza Soup. Now this wasn’t the first Pizza Soup I’ve tried to make. I tripped over a recipe by accident one day and I did make it in my slow cooker but the reviews were mixed and the flavour could have been stronger. So I was thrilled to find this variation. One of the things I love about this recipe is the mix of veggies. Makes it easy to get some solid veggie content into my kids but under the guise of pizza. Talk about win win. When I start to cook I’m a huge fan of going through the recipe and prepping all my ingredients. This way when I put it together it flows like a Food Network show. Starting with our onions and garlic. Now the first change I made is used olive oil in my version. We keep it in the house as our oil of choice and since I was going with a dish inspired by Italian flavours I hoped this would add another layer. 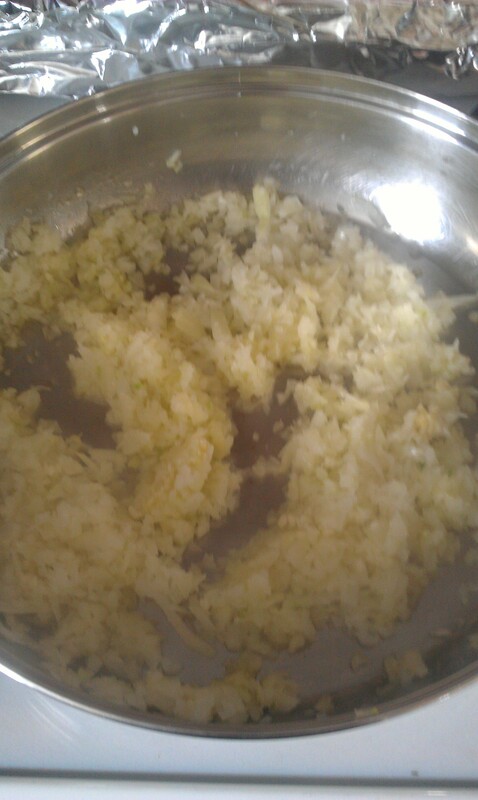 Here I have my onions and minced garlic in my heated olive oil. I gave the onions a bit more time to soften and sweeten as I was cooking for younger palates. 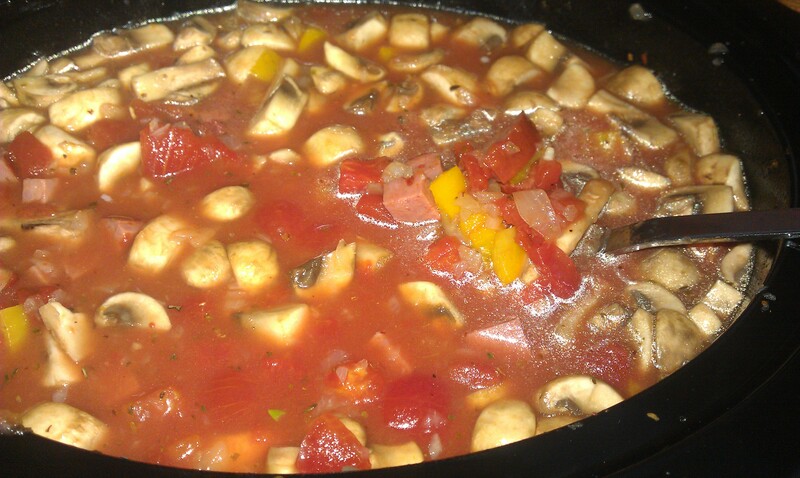 Adding in the pepperoni, mushrooms and bell peppers. 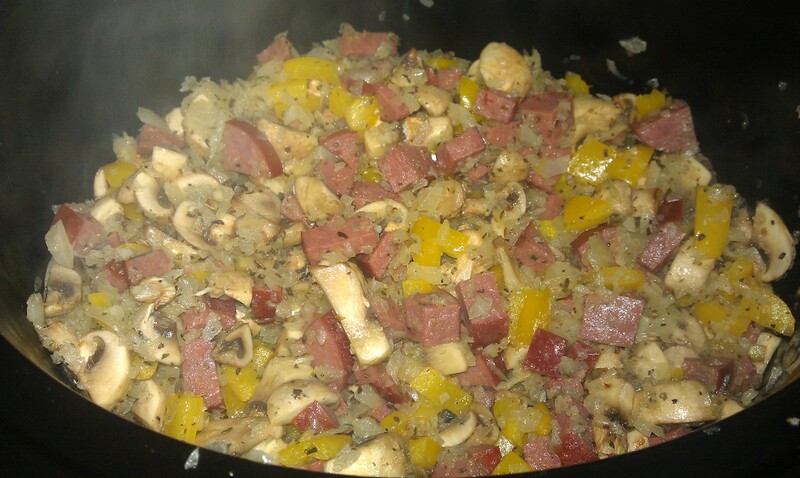 Once I had my onions and garlic where I liked it I added the other ingredients as the recipe suggested. Now you have the option of going with ham, turkey or pepperoni and I went with pepperoni as that is the one pizza topping that all 3 of my kids agree on. I did go with Winnipeg Old Country Pepperoni because I knew that a quality product would make the flavour really pop. Now for my friend who is a vegetarian I would suggest she go with her favourite vegetarian meat product like vegetarian bacon or you could always go with some portobello mushrooms along with the other mushrooms listed in the recipe. Using vegetarian broth is a suggestion from Canadian Living so I think this would be an easy recipe to make for a vegetarian family. Now I’ve gotten my ingredients to a good point where there is very little liquid in the frying pan and transfer them into my slow cooker. At this point I get to gauge if I am going to have enough for the kids, the babysitting teenagers and the little friend of my 3 year old who are all hanging out in our home for the evening. 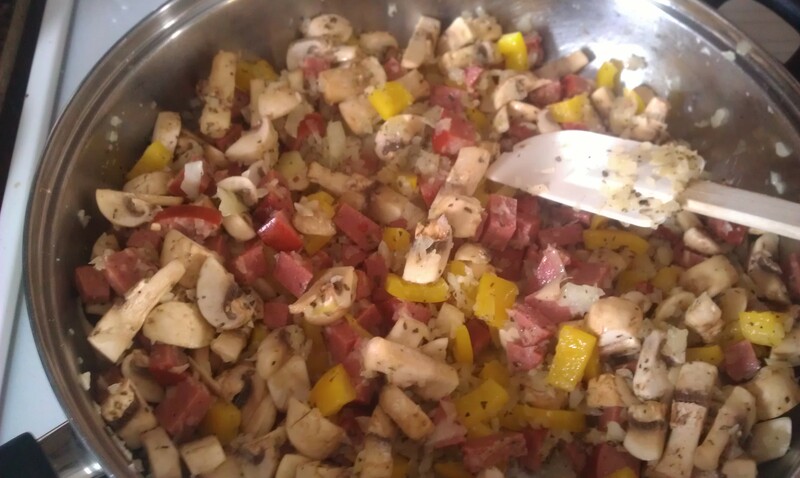 I doubled the recipe as printed and once I had my onions, garlic, pepperoni, mushrooms and bell peppers in the crock I was confident I would be able to have enough for everyone to enjoy just by how far the ingredients went up the side. A double batch nicely fit in my 6 QT Slow Cooker. Here is the soup prior to me turning it on low and letting it come together for a couple of hours. I then add the final ingredients to the slow cooker and give it a stir. I used a spoon to lift some up for the photo to show the tomatoes and other ingredients. One of my cans of diced tomatoes was one of Italian herbed ones. With the final ingredients I ended up with a full slow cooker. I put the lid on and it was on low for about 3 hours or so. I left some pre-shredded mozzarella and a loaf of garlic bread to go with the soup when it was served. I have to confess I was a bit excited to get home and get the review from my young diners. Thrilled to learn that it was a hit from the 3 year olds to the 16/17 year olds! I also had enough left over for some school lunches. Which is nice when the kids still have to go to school at -40C. Posted on January 28, 2013 by Shirley Robert	• This entry was posted in Cooking with Kids, Recipes and tagged canadian. living, dinner, garlic, hamilton beach slow cooker, make ahead, onions, pepperoni, pizza, pizza soup, school lunch, soup, thermos, vegetarian. Bookmark the permalink.